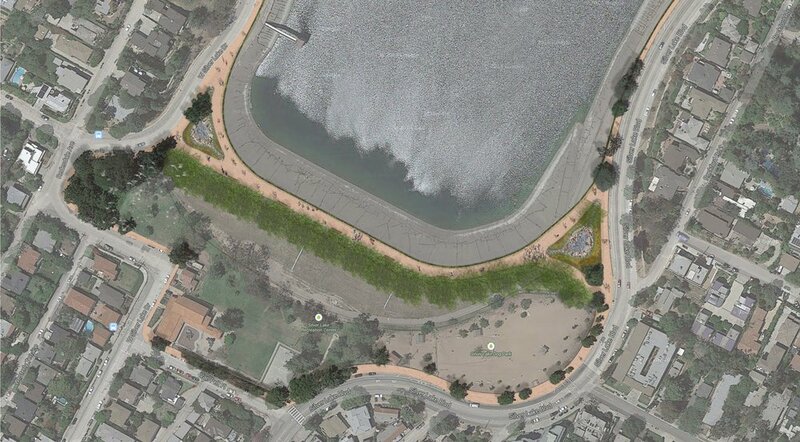 The 2000 Master Plan for the Silver Lake Reservoirs called for a safe, dedicated pedestrian path around the reservoirs. As of 2014, due to the diligence of SLRC, three phases of the path have been completed. In 2015, SLRC approached both LADWP and CD13 to convert the LADWP service road across the top of the south dam into the completion of the pedestrian path. This would not only provide fabulous water and mountain views, but would allow path users to bypass the narrow and uneven public sidewalk adjacent to the Recreation Center and Dog Park. Both LADWP and Councilmember Mitch O’Farrell expressed support for this project, which was discussed through a series of community meetings in 2016- 17. It received broad support from the community (by more than a 10/1 ratio) at a community event on the dam hosted by CD13, as well as from SLRC’s random sample community survey. LADWP crews began construction of the needed fencing and gates during fall 2017, with completion expected in early 2018. It will be open to the public during daylight hours and the gates will be closed and locked daily by LADWP security personnel. Many thanks to LADWP, Councilmember O’Farrell, and to all of the supporting community members!